Plot: You can keep your field-goal-kicking mules and your basketball teams in Flubber-soled sneakers; for real student-athlete high jinks, look no further than the Los Angeles College tennis team. Yes, Los Angeles College, where the athletic fund is at an all-time low because none of the school’s sports programs has had a winning season in years. President White (played by Christopher Lee) is so adamant about restoring the university’s reputation that he pulls a sword on athletic director Bettlebom (R.G. Armstrong) and demands he give more support to the conference-tournament-bound tennis squad. It doesn’t help that that tennis team is filled with “degenerates,” according to Bettlebom. (Although according to their coach Chip Williams, played by Richard Roundtree, they’re just “fun-loving.”) The team’s best player, known by all as “The Kid,” is a rebellious drunk in cut-up sweatshirts. The Kid’s best friend, Jeff, is a timid upper-class prude whose ex-fiancée Muffy has called him “the most boring man who ever lived.” And then there’s Tex, the slick-talking gambler; Ripper, the beefy party animal (played by Don “Ogre” Gibb of Revenge Of The Nerds fame); Cheeto, the pint-sized Mexican; and Andy, the African-American lothario. Though Coach Williams warns his boys that they’ll need to straighten up and win the championship in Las Vegas if they want to keep their scholarships, The Kid plans to drink all night, play blackjack with Jeff’s tuition money, bed any woman who’ll have him, and still beat those stuck-up jerks from Dallas Tech. But that may not be as easy as The Kid thinks. Even hungover, LAC blows past their semi-final opponents, using all their usual tricks: Ripper growls; Tex waves a wad of money around; Cheeto dances around and prays; Andy pretends to be gay; and The Kid tells the guy he’s up against to check out the rack on the girl in the front row. The next day though, Dallas Tech turns LAC’s strategy around on them. They have a Jewish player, who intimidates Cheeto with his faith; and an actual gay player who messes with Andy’s head; and a bruiser as big as Ripper. 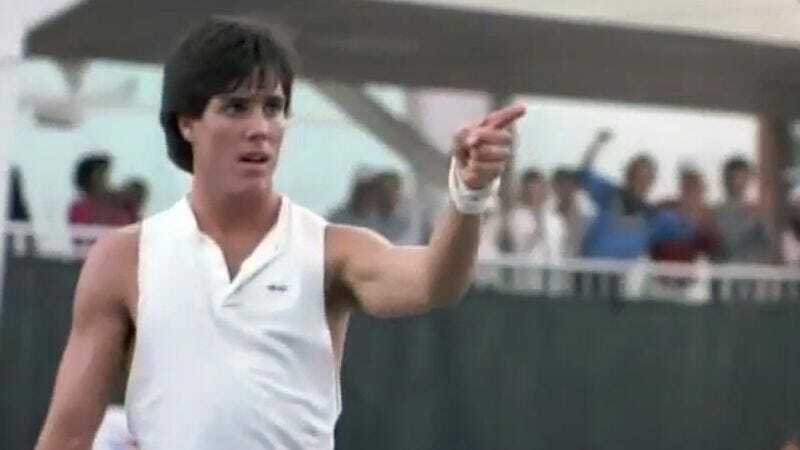 Worse, The Kid throws his singles match in the finals because the boys from Dallas Tech have threatened to frame him for gambling if he wins. But then foxy D-Tech student Nicole (played by Mariska Hargitay) lets The Kid know how ashamed she is, so The Kid has a change of heart and encourages his teammates to rally—a comeback that begins when Ripper whacks a tennis ball and hits his counterpart square in the nuts. Key scenes: The Kid gets his junker towed by Jeff, but the rope breaks and the car rolls downhill, crashing into a malt liquor truck. Is this a party or what? Later, the boys swagger into Las Vegas, where Andy gets a chance to wow the ladies with his free-associative comedy, and Ripper gets a chance to… well, rip. And in keeping with the “gays are grotesque” sub-theme running through Jocks, later when The Kid is tripling Jeff’s money at the blackjack table, he gets hit on by a transvestite, whom The Kid exposes by leaning in for a kiss and then yanking down the man’s top so that his falsies fall out in front of the whole casino. Can easily be distinguished by: Some of the most turgid montages ever committed to film: from an opening sequence that alternates indistinct tennis warm-ups with long, monochrome credits; to a “driving to Vegas” scene that’s slow and choppy; to a climactic match that’s a flurry of quick shots and generic cutaways. Sign that it was made in 1986: The Kid shows just what a badass he is by walking around in a cut-up Huey Lewis & The News sweatshirt.